Do you have enough energy every day? Are you satisfied with the physical state of your body? If your answer to these questions is “no,” it may be time to evaluate your lifestyle. What will it take so that no matter where you are or what you’re doing, your commitment to health stands strong? What principles are you going to incorporate into your daily routine so you can achieve the physical identity you have only dreamed of? You want to be your best every day: strong, energetic, healthy and in great physical condition. It doesn’t matter how far you are from that goal. What matters is your determination to reach it. It’s time to take charge of your life. Stop spending your hard-earned money on quick fixes and “experts” who don’t know what’s important to you. 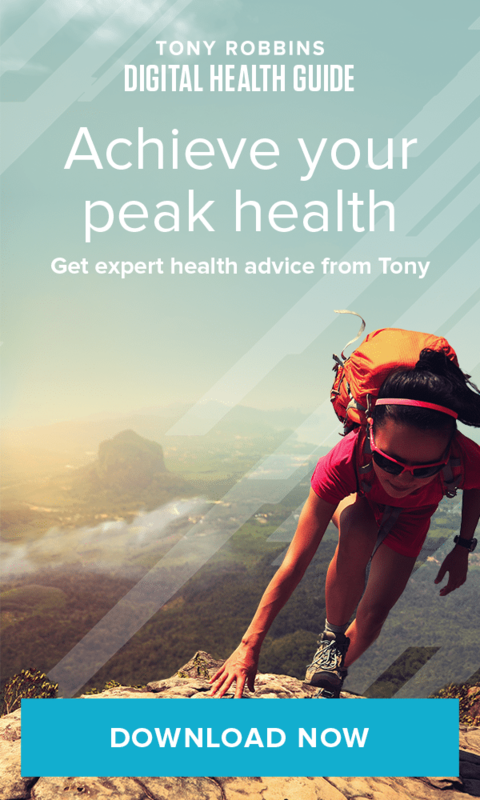 Achieve a peak state with Tony’s 10-Day Challenge and learn what is possible when you truly hold yourself to the highest possible standards. We challenge you to apply a new set of principles that will help you transition into a lifestyle where your body and your health can achieve a peak state. Tony’s 10-day diet is designed around 12 core principles that create health and vitality, helping you look better, feel better, have more energy and optimize all the areas of your life that are most important to you. Don’t be fooled by “magic” solutions. Programs, products, books and ideas about how to prevent disease, lose weight, increase your strength or improve your appearance are a $100 billion industry. It’s true: We spend that much annually, searching for the special formula that will yield amazing fitness and alluring physical beauty. Yet, in the United States alone, two-thirds of people are overweight, 25 million people suffer from diabetes and half are on some type of prescription drug. What does this tell us? It’s not working! Perhaps that’s because the solution to these challenges does not lie with technology, science, pharmacology or even the many “quick fix” solutions available. Nor does it require you to put your time, money and resources into an outside “expert” who will tell you what to do. 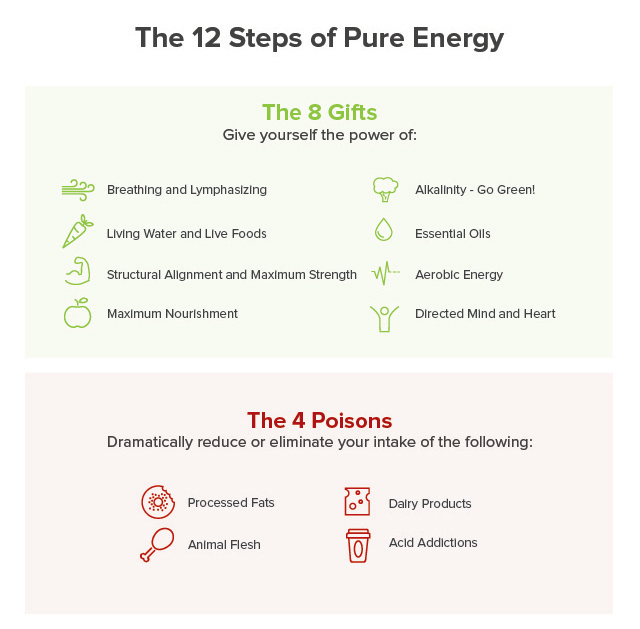 You can revitalize and transform the most important areas of your life – physical health, energy and vitality – if you commit yourself with full force to our 10-day energy diet. You will not only lose weight, feel better and experience greater energy, but you’ll have a renewed sense of excitement, joy and possibility for your entire life. When was the last time you truly paid attention to your breath? Breathing comes so naturally to us, we don’t often stop and focus on it. But doing so has many benefits for the body and mind. One of the best ways to help oxygenate your body is to learn how to breathe correctly. Why is oxygenating important? Oxygen is picked up by the hemoglobin in the blood and distributed to all of the body’s trillions of cells, where it is then used to fuel the cells and release energy (ATP). In addition, the body is largely composed of the element oxygen. This is why the optimal oxygenation of your cells through proper nutrition, fluid intake, exercise and stress management is crucial in order to maintain your health and create a vital life. Discover the power of vital breathing during your 10-Day Challenge: Take 10 Power Breaths 3 times each day in the ratio 1-4-2 (inhale for 8 seconds, hold for 32 seconds, then exhale for 16 seconds). Lymphasizing is all about stimulating and improving your lymphatic circulation. Your lymphatic system is a network of tissues and organs, such as the spleen and the thymus, that is responsible for cleansing and nourishing your body. But unlike your cardiovascular system, your lymphatic system has no circulatory pump of its own. It depends upon physical exercise and movement to propel lymph fluids throughout your body. Research has shown that an exercise technique called rebounding will help your lymphatic system the most. Each day, 20–30 minutes of rebounding, or bouncing, preferably on a “rebounder,” will help provide the ideal conditions for cleansing your cells. Rebounding has innumerable benefits, including providing the stimulus for a free-flowing lymphatic drainage system, which helps rid your body of toxins, cancer cells, wastes, trapped protein, bacteria, viruses and other waste the cells cast off. Would it surprise you to learn that simple water is a major part of an energy diet? Water is an essential and major component of all living matter. It is the largest single component of the body: Our brains are 76% water, our lungs are 90% water, our blood is 84% water and blood plasma is 98% water. Critical bodily functions such as digestion, circulation and excretion cannot occur without it. It carries nutrients to all vital body substances, plays a crucial role in maintaining body temperature and serves as building material for growth and repair of the body. Give your body the water it needs by drinking half of your body weight in ounces daily (for example, if you weigh 150 lbs., you will drink 75 ounces of water per day). And strive for at least 70% of your diet to consist of water-rich foods. This will allow your body to cleanse itself. During this 10-day diet, you can say “yes” to fats. Fats are actually very important to our overall health; the secret is to know which fats are healthy and which fats are not. Completely eliminating fat from your diet is one of the worst things you can do. Essential fatty acids, like Omega 3 and Omega 6, are healthy or healing fats – every cell in your body requires them to function, particularly your brain, which is made up of 60% fat. Your body must consume these fats to survive. Without them the lipid membrane around your cells starts to break down. Gift 4: The power of alkalinity – go green! Balance is important in all aspects of your life, and that includes within your body. One of your body’s highest priorities is to make sure that its alkalinity remains at a level supporting cellular life. Balanced body chemistry and maintaining a proper ratio between acid and alkaline foods in your diet are of vital importance to maintaining your health. In fact, too much acidity in the body’s tissues is the cause of many types of health changes, ranging from lethargy and fatigue to obesity, and ultimately to much bigger health challenges and disease. Avoid acid-forming foods that are devoid of life: animal meats, dairy products, refined white foods, sugars, caffeine, etc. Keep it simple: add fresh lemon to your water daily! Aerobic exercise is vital to your health, and is a critical part of this 10-Day Challenge. The term “aerobic” means “with oxygen” and refers to moderate exercise sustained over a period of time. Your aerobic system gives you your endurance, and it encompasses the heart, lungs, blood vessels and aerobic muscles. If you condition your metabolism to operate aerobically, and supply it with proper diet and exercise, you burn fat as your primary fuel. Build your base with 30 minutes of quality exercise 3–5 times per week (walk, run, swim, bike, take an aerobics or spinning class, ski, snowboard, etc.). This will also help lower your set point. Understand your ideal aerobic training heart rate: 180 minus your age. Create a training plan: Once you have a base established, craft a regimen that will take your health to the next level. Make it fun: Add elements to your routine (music, friends, a change of environment, a compelling race, etc.) to motivate you to follow through. Celebrate and Reward: Supplement for specific conditions and maximize your results! The motion of the human body is a gift. Even if you are not athletic, as long as you can move your body, you can enjoy this gift. The human body was designed for motion, yet few of us actually use the full range of movement. This gift, the power of structural alignment and maximum strength, is designed to take charge of the motion-powered musculoskeletal system. Exercising this system is one of the primary foundations and frameworks for human health and the systems that support it. Move! Avoid living in a box: Take the stairs, stay active and move as many muscles in your body as you can daily! For thousands of years, alternative forms of medicine have focused on a natural, internal ability of the body to raise its resistance, fight disease and create health. One of the most potent biological mechanisms that promotes this type of health and healing is found directly in the mind. Utilized and directed effectively, our thoughts, emotions and mindset can be one of the most potent allies toward mitigating disease and manifesting energy and vitality. Stand guard at the door of your mind: Condition empowering emotions such as gratitude, courage, faith, determination, compassion and love. Break your pattern and avoid emotions that create stress. Utilize the healing power of the heart: Three times a day stop what you are doing and shift your focus (mind, breath, emotion) to the area around your heart. Your 10-day diet isn’t just about calorie-cutting and working out. On average, Americans consume 35–40% of our total calories in fat. The major kinds of fats in the foods we eat are saturated, polyunsaturated, monounsaturated and trans fatty acids. In Gift 3, we learned that not all fats are bad – but some of them are. The dangers of bad fats (or processed fats) include poor circulation (leading to high blood pressure), poor elimination, excess congestion and toxicity in the body. In addition, the body is not able to perform the functions that good fats (or unprocessed fats) provide. Are you a meat eater? You’re in good company, as most Americans eat meat. However, in order to maximize your health, you may need to reevaluate this part of your diet. Countless studies and innumerable amounts of research have shown a direct relationship between an animal-based diet and such chronic illnesses as heart disease, diabetes and cancer. Even small amounts of animal-based foods can cause adverse effects. If after the 10-Day Challenge you decide you still must consume animal flesh, follow the rules: eat it once a day, combine it with green vegetables/salad, eat it in the middle of the day and choose a source that is free range, kosher, antibiotic free and organic. Dairy is another diet component that is very popular – and that simply isn’t very good for you. Recent studies on the effects of dairy products have shown that dairy makes a greater contribution to osteoporosis, kidney problems and certain forms of cancers. In one of the most prominent and comprehensive nutritional studies to date, The China Study, lead researcher Dr. T. Colin Campbell found that cancer was consistently promoted by casein, which makes up 87% of cow’s milk protein. Additionally, women who eat diets rich in animal foods excrete more calcium in their urine, providing a negative calcium balance. This can be one of the toughest parts of achieving your optimal health and fitness, because acid addictions are frequently some of our favorite things: a morning cup of coffee, an evening glass of wine. But if you associate yourself to the consequences and break your pattern, those cravings will go away. A diet that promotes over-acidification of the blood and tissues allows for a terrain that is conducive to the growth of virus, bacteria, yeast and fungus – the great decomposers of cells and tissues in the human body. To reduce and eliminate acid, you need a diet consisting of live alkaline foods: dark green and yellow vegetables, soy beans, sprouted nuts, seeds, grains and essential fatty acids. This diet lowers the over-acidification of the blood and tissues with its abundance of bases and alkaline salts. Eliminate or dramatically reduce your consumption of acid addictions. Use your common sense! Say no to the following addictions: caffeine, sugar, whites, vinegar, alcohol, nicotine and drugs. Alkalize! When you are consuming at least 70–80% alkaline, life-giving foods, your body will naturally decrease its desire for these addictions. A green-based supplement such as Tony Robbins’ BioEnergy Greens will also help decrease this desire. Tony’s 10-day diet isn’t easy – but it is worth it. As Tony says, “If you’re not growing, you’re dying,” and challenges like this one will do wonders for your personal growth. Want to learn more about living healthy and weight loss? Take a look at our comprehensive resource guide, How to Achieve Lasting Weight Loss. Want to learn about living healthy and weight loss? Take a look at our comprehensive resource guide, How to Achieve Lasting Weight Loss.